Brother of Jacob Bernoulli, the father of Daniel Bernoulli, Nicolaus II Bernoulli, [and Johann II Bernoulli, and the uncle of Nicolaus I Bernoulli. Johann was born in Basel, the son of Nicolaus Bernoulli, an apothecary, and his wife, Margaretha Schonauer, and began studying medicine at Basel University. 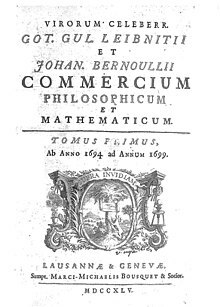 His father desired that he study business so that he might take over the family spice trade, but Johann Bernoulli did not like business and convinced his father to allow him to study medicine instead. However, Johann Bernoulli did not enjoy medicine either and began studying mathematics on the side with his older brother Jacob. Throughout Johann Bernoulli's education at Basel University the Bernoulli brothers worked together spending much of their time studying the newly discovered infinitesimal calculus. They were among the first mathematicians to not only study and understand calculus but to apply it to various problems. After graduating from Basel University, Johann Bernoulli moved to teach differential equations. Later, in 1694, he married Dorothea Falkner[a] and soon after accepted a position as the professor of mathematics at the University of Groningen. At the request of his father-in-law, Bernoulli began the voyage back to his home town of Basel in 1705. Just after setting out on the journey he learned of his brother's death to tuberculosis. Bernoulli had planned on becoming the professor of Greek at Basel University upon returning but instead was able to take over as professor of mathematics, his older brother's former position. As a student of Leibniz's calculus, Bernoulli sided with him in 1713 in the Leibniz–Newton debate over who deserved credit for the discovery of calculus. Bernoulli defended Leibniz by showing that he had solved certain problems with his methods that Newton had failed to solve. Bernoulli also promoted Descartes' vortex theory over Newton's theory of gravitation. This ultimately delayed acceptance of Newton's theory in continental Europe. Although Johann and his brother Jacob Bernoulli worked together before Johann graduated from Basel University, shortly after this, the two developed a jealous and competitive relationship. Johann was jealous of Jacob's position and the two often attempted to outdo each other. After Jacob's death Johann's jealousy shifted toward his own talented son, Daniel. In 1738 the father–son duo nearly simultaneously published separate works on hydrodynamics. Johann attempted to take precedence over his son by purposely and falsely predating his work two years prior to his son's. The Bernoulli brothers often worked on the same problems, but not without friction. Their most bitter dispute concerned the brachistochrone curve problem, or the equation for the path followed by a particle from one point to another in the shortest amount of time, if the particle is acted upon by gravity alone. Johann presented the problem in 1696, offering a reward for its solution. Entering the challenge, Johann proposed the cycloid, the path of a point on a moving wheel, also pointing out the relation this curve bears to the path taken by a ray of light passing through layers of varied density. Jacob proposed the same solution, but Johann's derivation of the solution was incorrect, and he presented his brother Jacob's derivation as his own. ^ Published in 1690, submitted in 1694. ^ Sanford, Vera (2008) . A Short History of Mathematics (2nd ed.). Read Books. ISBN 1-4097-2710-6. OCLC 607532308. ^ Fleckenstein, Joachim O. (1977) . Johann und Jakob Bernoulli (in German) (2nd ed.). Birkhäuser. ISBN 3764308486. OCLC 4062356. ^ Livio, Mario (2003) . The Golden Ratio: The Story of Phi, the World's Most Astonishing Number (First trade paperback ed.). New York City: Broadway Books. p. 116. ISBN 0-7679-0816-3. ^ Maor, Eli (1998). e: The Story of a Number. Princeton University Press. p. 116. ISBN 0-691-05854-7. OCLC 29310868. ^ Coolidge, Julian Lowell (1990) . The mathematics of great amateurs (2nd ed.). Oxford: Clarendon Press. pp. 154–163. ISBN 0-19-853939-8. OCLC 20418646. ^ Struik, D. J. (1969). A Source Book in Mathematics: 1200–1800. Harvard University Press. pp. 312–6. ISBN 978-0-674-82355-6. This page was last edited on 31 December 2018, at 01:10 (UTC).